With the obesity epidemic spreading across the country, marketers have learned how to take advantage of America's perilous health status. Whether you turn on the television, flip through a magazine or walk through your local shopping mall or grocery store, vitamin advertisements make a wide variety of enticing health claims. With so many promises jumping off the vitamin labels, you may be tempted to include several vitamins in your daily diet. But before initiating a supplementation routine, it is important to know the dangers of mixing vitamin supplements. Although vitamins are often touted as healthy and beneficial, taking too many can actually harm your health. In fact, The Journal of the American Medical Association published an article in 2007 claiming that certain supplements could actually increase your risk of death if taken in high doses. Although this increased risk of death is only associated with certain vitamin supplements, such as vitamin A, a wide variety of negative symptoms can occur from overdosing on any vitamin. When you are mixing vitamin supplements, carefully inspect the ingredient labels to determine the exact quantities of each vitamin you are consuming. A vitamin overdose can seriously harm your body. For example, vitamin B6 overdose can lead to permanent nerve damage, while calcium overdose can cause depression and muscle fatigue. Other common symptoms of vitamin overdose include headache, nausea, vomiting, diarrhea, loss of appetite and fatigue. When taken in high doses, vitamins can interact with one another to produce negative side effects on the body. For example, high doses of calcium could interfere with your body's ability to absorb iron. On the other hand, high doses of vitamin A can hinder the ability of vitamin D to function properly inside the body. When the effectiveness of vitamin D is reduced, your bones become weak and more susceptible to fracture. Before mixing vitamins, speak with your physician or pharmacist regarding potential interactions. As with all medications, vitamin supplements may cause certain side effects. For example, vitamin E is commonly taken to reduce the risk of a heart attack, since the vitamin naturally thins the blood. Although this side effect is generally safe, it can become dangerous if you mix your vitamin E supplement with another vitamin that prevents blood coagulation. If the blood becomes too thin and cannot clot, your risk of developing a hemorrhagic stroke significantly increases. Carefully monitor the various side effects you can expect to encounter with your vitamin supplements. As a general rule, if two supplements claim to have the same effect on the body, they should probably not be mixed. 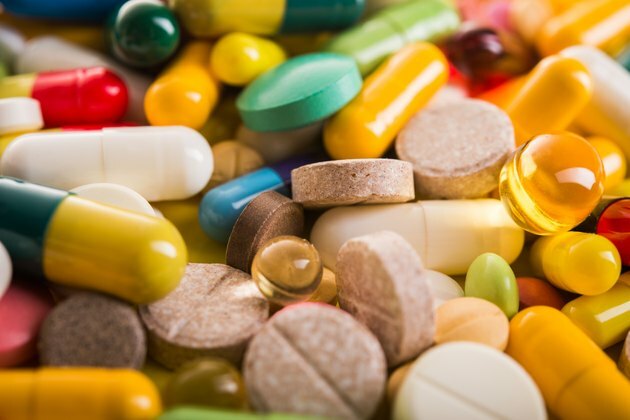 Before taking vitamin supplements, consult your physician or pharmacist regarding the potential dangers of mixing supplements. If you choose to take more than one vitamin supplement, carefully monitor the amounts of each vitamin you intake every day. Do not take any supplements with an incomplete list of ingredients. ABC News Medical Unit: Are Too Many Vitamins Bad for Your Health? Real Simple: Can You Get Too Many Vitamins?